Look, Night in the Woods is seriously a masterpiece. At various times I cried, I cheered, I was angry at characters or regretted something that happened. 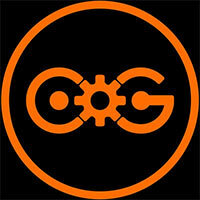 I saw a bit of myself in every character, related to the world, smiled at all the gameplay segments, and more. I can’t recommend this game enough. Spend a night in the woods. Come home. Night in the Woods is a strange tale with an even stranger cast of characters, but it revels in its oddities. The excellent writing pulls off a realistic sense of cynicism, childlike wonder, and comradery between friends. With its careful balance between adult themes and youth, it captures a stage of life that is confusing, frightening, and thrilling. Night in the Woods is a masterpiece, which may come across like lofty praise considering its indie nature, but it’s wholly earned in every way. It’s not going to appeal to everyone, but if you are an adventure, Metroidvania, sandbox, 2D platformer, or point-and-click fan, then please do yourself a favor and play this interesting, moving, hilarious, and fun experience. There isn't an adequate term for titles that blend clunky platforming with choose-you-own-adventure friendship simulators. Nor is there a word to describe games that feature knife-fighting minigames and Guitar Hero-inspired band practices. But, again, maybe that's a big part of Night in the Woods' appeal. It's a confident outsider, and one that takes pleasure is celebrating the weird ways that everything comes together in life. 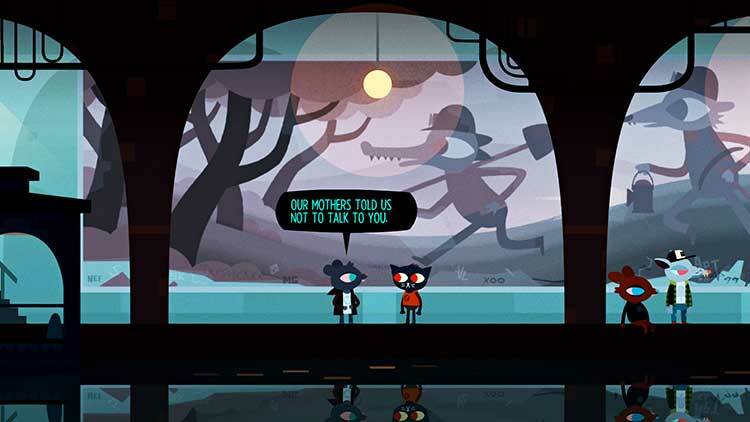 Night in the Woods es un juego para gente madura que quiere vivir una historia donde detrás del humor y los colorines hay una realidad muy auténtica. Cuando decimos "gente madura", simplemente nos referimos a jugadores preparados para comprender una historia con la que un joven adulto puede sentirse identificado. 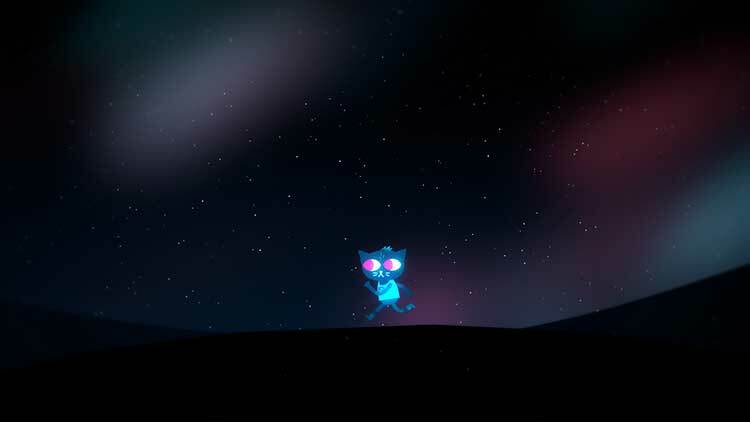 Night in the Woods es uno de los títulos más complejos y necesarios del momento histórico que vivimos. Una intensa reflexión poliédrica sobre la sociedad, la política, la economía y el pasado y futuro de todos y cada uno de los jugadores que se sienten frente a él. Un título cargado de significados que invita al jugador a rejugarlo constantemente para tratar de encontrar todas las caras posibles de su discurso. 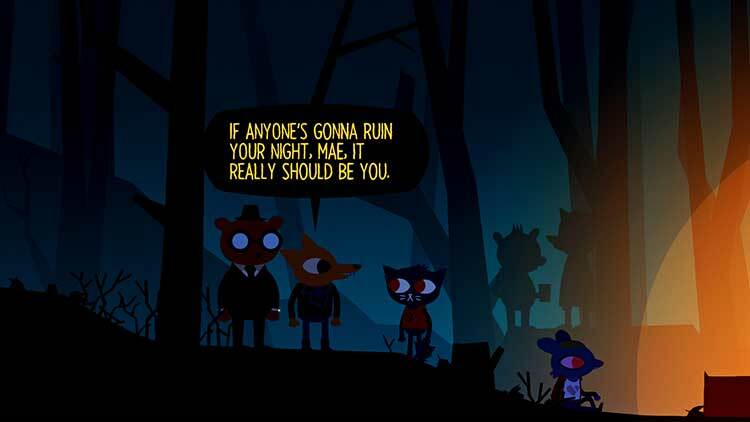 Night in the Woods es un grito punk por y contra diversos aspectos de nuestra sociedad, las relaciones sociales y nuestra propia vida. Todo ello desde el punto de vista de una post-adolescente (o pre-adulta) de 20 años, con las emociones, decisiones y sentidos que ello conlleva; y embadurnado con un estilo artístico, tanto en lo visual como en lo sonoro, original, agradable y que refuerza la historia humana con tintes sobrenaturales que se nos está contando. 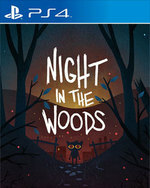 Attachant et bourré de qualité, Night in the Woods est une belle production écrite et réalisée avec soin, qui nous propose un univers à même de toucher le public auquel il se destine. La présence de nombreux secrets parvient également à lui donner un soupçon de rejouabilité, bien qu'il reste trop tendre sur ses idées de gameplay pour renouveler le genre et souffre parfois de problèmes de rythme induits par la construction routinière du quotidien de son héroïne, Mae. 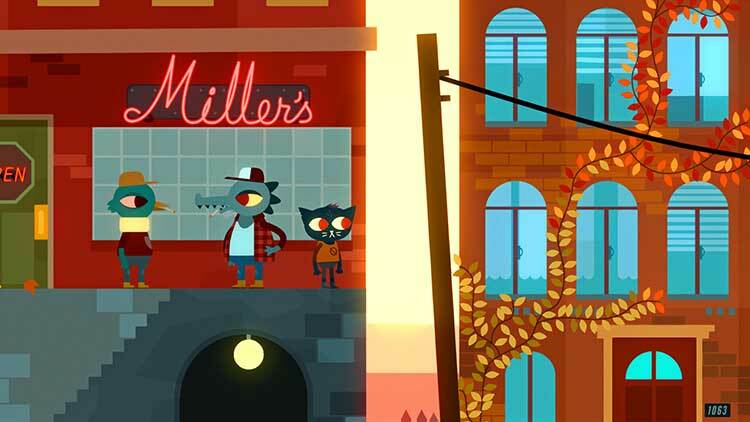 L'unico, grande cruccio relativo a Night in the Woods è la mancanza di una localizzazione nella nostra lingua, che impedirà a larghe fasce di pubblico di coglierne la grandezza. Sì, perché di grandezza si parla: un coacervo di sarcasmo, sentimenti, acutezza, inserito in uno spaccato impietoso (ma mai eccessivamente pesante) della provincia americana odierna, con tutte le sue contraddizioni e le sue debolezze. Night in the Woods это не история одной лишь Мэй Боровски, пытающейся приспособиться к изменчивой действительности. Это меланхоличный, но полный надежды, взгляд в сторону увядающего городка и всех его жителей. Взгляд на проблемы, из которых соткана их (да и наша тоже) жизнь, и на крохотные, но от этого не менее значимые, радости. Пожалуй, это не столько игра, сколько возможность взглянуть со стороны на саму жизнь, попытаться вникнуть в ее суть и принять во всем ее многообразии. Niektóre rzeczy mogły wyjść lepiej, pewnie. Należy jednak pamiętać, że Night in the Woods to przede wszystkim opowieść. Świadoma siebie historia, w której każdego środka wyrazu użyto z premedytacją. Tu mistycyzm płynnie łączy się ze smutną codziennością, tworząc nietuzinkową i poruszającą mieszankę w sugestywnej oprawie. 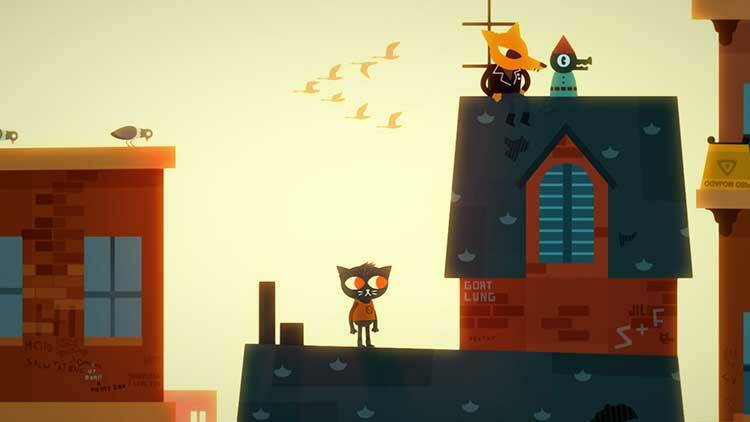 Night in the Woods nie jest może idealne, ale pozostaje perełką dla wrażliwych. Potrzebujemy takich więcej. Det är i mångt och mycket detaljerna som gör Night in the Woods så minnesvärt och även om jag vill berätta mer om hur storyn utvecklar sig, om exakt vad som sägs och hur jag upplevt vissa minnesvärda scener så vill jag hellre att du upplever allt detta på egen hand, istället. Ämnen som nyfikenhet, depression, kamratskap, lojalitet, ifrågasättande, tvivel, cynism är alla inkluderade här och även om det börjar lite för segt, är det naturligtvis ett äventyr du bara inte får missa.